Jane of All Crafts: Get the crap out of my house link up part-tay! 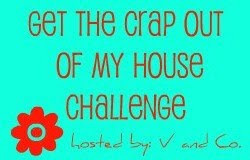 So today I am linking up with Vanessa at V and Co. She has a challenge going on to help people organize and declutter. (Um..she is amazing by the way...she's super crafty and really funny too) The challenge is to tackle something like a closet or drawer or if you're feeling gung ho, maybe even a whole room and just get rid of the crap you don't want, don't use, or is just junk that is taking up space. Those of you who know me know that this is right up my alley. I'm one of those weirdos who enjoys organizing and decluttering. Clutter stresses me out and if it gets out of control I get overwhelmed. I try to stay on top of it but some days watching soaps and eating bon bons is waaaaay more appealing. Ha ha...does anyone actually eat bon bons? And the last time I watched a soap Kristen was married to John and Stefano was alive....again. Okay before I get too side tracked and go searching for some bon bons, let's get to it! The one place in my house that gives me the most anxiety is the black hole garage. The whole garage is craptastic but I will be focusing on my craft area. The challenge started last week, a.k.a before i had a blog, so I am a bit behind. But I will show you what I have done so far. My goals for this space is to go through and organize so that when I want to do a project it would be easy to get my supplies and also to clean up when I was done. Awhile ago I purchased the shelves and plastic shoe containers. I put like items together. It is working well but there is no room as my craft supplies grow. I also bought these wire shelves at Target for $16.99 (score! )...they work great for my fabric, when it's actually on the shelves. I found the sheet at a thrift store to keep over the shelves to cut down on the dirt and dust since I am in the garage. Would love something a bit nicer but this will have to do for now. I haven't finished the whole area yet but I did get my fabric shelves organized and put all my fabric back on them! I also have been wanting to put up an inspiration board. So I bought 4 cork squares and used furniture tacks to put them up. That basket with all the fabric? Those would be all my scraps...thinking of making a patchwork quilt with those! So there you have it. I still need to do some fine tuning and make it "pretty" Any ideas how I could decorate my inspiration board? It's not exactly...inspiring ;-) So I hope I have inspired you to tackle some clutter in your life. And when you have weeded out the crap remember to donate what you can because it may be someone else's treasure! Okay, okay one last thing...see this? It's a planter...got it for 10 bucks at Joannes. It was originally $35!!! Whoot whoot! When I bought it I thought it would be great in my kitchen over the sink with a pretty soap dispenser maybe? Then I thought I could put it in my craft area to add some of that "pretty" I was talking about. But what the heck could I use it for? Any ideas? More craft area organizing and decrapification to come! Good for you! It's so much easier to be creative in a clean space. Isn't blogging fun! As for your planter, grab some cute jars, fill em with buttons, etc and put them on there. love your makeover! it looks so organised! that cute planter thingy could be cute holding rolls of ribbons (if you have them) and because of its open design, you could have the end of the ribbon poking out, and just pull on it and cut from there, like a dispenser! So far so good! Craft areas are always so hard to keep tidy. I guess it's just the nature of the beast. I love that planter. I might spray paint it a different color though so it stands out against the white walls.